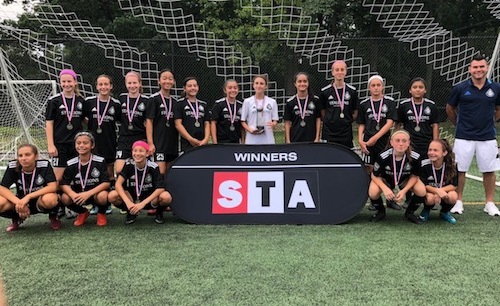 At this year's STA Fall Kickoff, two top NJ Stallions Girls teams finish as Champions and FInalists. The U14G NJ Stallions 05 North Utd NPL team take 1st Place in the Gold Division, and the U14G NJ Stallions A-Game 2005 team take Finalist honors in the Platinum Division. The NJ Stallions 05 North Utd NPL girls finished with a 3W 1 L record as Champions with victories over PSA Princeton Elite, GPS Central 05, and Watchung Hills 05 Samba. The NJ Stallions A-Game 2005 EDP-NL girls team also recorded victories in their road to 2nd Place over highly ranked opponents in PSA Wildcats, PSA SDFC 05 Elite, and STA-MUSC 05 EDP. The A-Game 2005 girls are now ranked #2 in NJ, #9 in Region I and are in the top 50 nationally at #31.